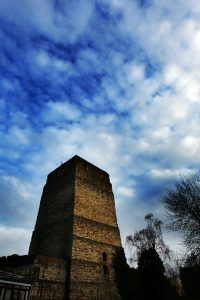 CLIMB the Saxon St George’s Tower, one of the oldest buildings in Oxford, and enjoy its stunning 360° panoramic views over the historic city of Oxford. DESCEND deep underground into the dark atmosphere of the 900-year-old crypt, the only surviving remains of St. George’s Chapel. EXPLORE the austere confines of the 18th-century Debtors’ Tower and Prison D-Wing. SCALE the Mound of the 11th-century motte-and-bailey castle. * Group discounts may be restricted over certain periods. Please call for further information. 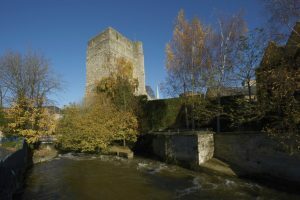 Groups can explore Oxford Castle & Prison from a different perspective on an Outdoor Walking Tour. 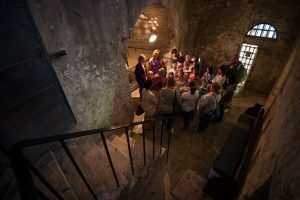 Embark on a journey of discovery with a costumed character guide; glimpse the hidden secrets of the site in the ancient underground well chamber; climb the castle mound to enjoy stunning views of the dreaming spires, and learn more about the incredible castle buildings and their role in over 1,000-years of Oxford’s past. 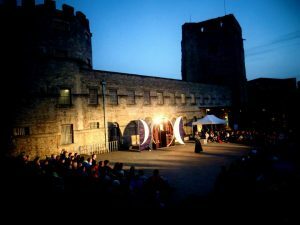 The Oxford Shakespeare Festival will once again grace the Oxford Castle summer theatre stage in 2018, with four of the Bard’s most well known and loved productions brought to life in the historic castleyard. Following the success of 2017’s festival, attended by over 4,000 people, 2018 promises eight weeks of entertainment from three of Oxford’s most talented theatre companies. For more information please contact our bookings team on 01904 261262. If you are looking for some inspiration on your planning, have a look at our Group Itineraries. Please call us on 01904 261262, or email us at groups@continuumattractions.com to make a booking.